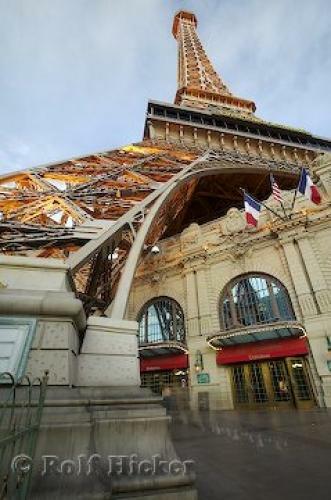 With a replica of the Eiffel Tower and a full service hotel with french cafes and bakers, Paris of Las Vegas is a great place to stay in Nevada. ... The night time agenda at the hotel is full of life with a nightclub, various entertainers and bars and lounges where you can enjoy a few cocktails.The Paris Hotel is one of the top rated hotels along the Las Vegas Strip and it makes you feel like you are actually in Paris with the European furnishings and ambiance.Paris Las Vegas, Eiffel Tower, Vegas Strip, Las Vegas, Nevada, USA, North America. I photographed this photo with the digital SLR camera model Canon EOS-1DS, aperture of f/22.0, exposure time of 16/5 sec. on ISO 50, as always I used a original Canon Lens, the focus lenght for this picture was 16mm.